This new work is dedicated to glasses and their variants which can be used as biomaterials to repair diseased and damaged tissues. Bio-glasses are superior to other biomaterials in many applications, such as healing bone by signaling stem cells to become bone cells. Of interest to the biomedical as well as the materials science community. 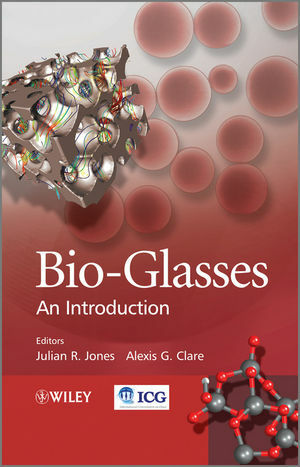 The book covers all types of glasses: traditional glasses, bioactive glasses, sol-gel glasses, phosphate glasses, glass-ceramics, composites and hybrids. Alongside discussion on how bio-glasses are made, their properties, and the reasons for their use, the authors also cover their applications in dentistry, bone regeneration and tissue engineering and cancer treatment. Its solid guidance describes the steps needed to take a new material from concept to clinic, covering the essentials of patenting, scale-up, quality assurance and FDA approval. Dr Julian Jones is a Senior Lecturer and Royal Academy of Engineering and EPSRC Research Fellow at Imperial College, London. He has 40 peer reviewed publications in leading journals in the field of Biomaterials and has co-edited a leading textbook. His work has been recognised by award of a prestigious Philip Leverhulme Prize in 2007, for excellence in Engineering; the Tissue and Cell Engineering Society (TCES) Early Investigator Award in 2008; and the Institute of Materials, Mining and Minerals (IOM3) Silver Medal, for outstanding achievement in Materials Science and international promotion of the subject. His work has featured in the media with articles in the Daily Mail and Daily Telegraph and an interview on Radio 5 Live. Dr Alexis Clare is Professor of Glass Science at the Inamori School of Engineering, Alfred University, NY, USA.